Recombinant Protein A beads is an affinity chromatography medium designed for easy, one-step purification of classes, subclasses and fragments of immunoglobulins from biological fluids and from cell culture media. The recombinant protein A ligand is coupled to 6% highly cross-linked agarose. The coupling is optimized to give high binding capacity for immunoglobulins. The static binding capacity of Protein A beads is greater than 30 mg rabbit IgG/ml settled beads. The dynamic binding capacity will vary depending on several factors such as target antibody, flow rate etc. Protein A, a bacterial cell wall protein isolated from Staphylococcus aureus, binds to mammalian IgGs mainly through Fc regions. Native protein A has five IgG binding domains and many other domains with unknown functions. 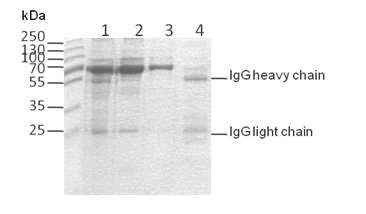 Recombinant protein A contains five high affinity IgG binding domains with other non-essential domains removed to reduce nonspecific binding. Since only the Fc region is involved in binding, the Fab region is available for binding antigens. Species: Recombinant Protein A expressed in E.coli. Note: High temperature heating is not recommended. The agarose melts above 65°C. Figure 1 shows purification results of human serum by rProtein A beads of competitor. 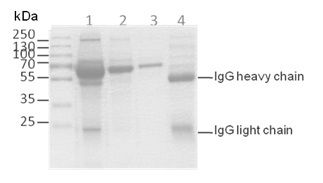 Figure 2 shows purification results of human serum by rProtein A beads of ZonHon Biopharma.